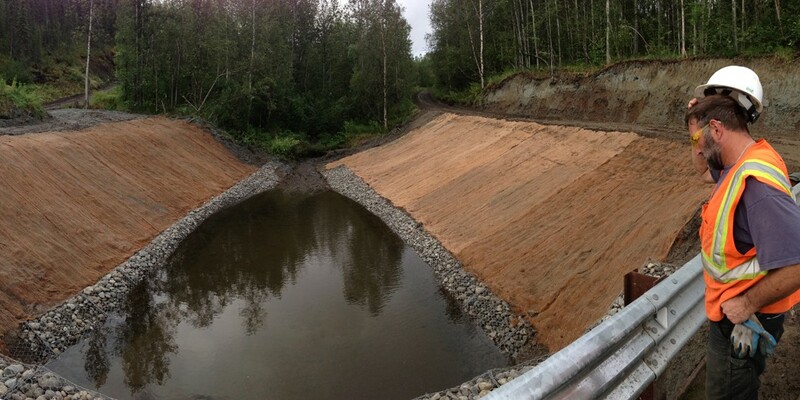 Weston implemented Interim Corrective Action to reduce the impact of mine tailings to creek through realignment and stabilization of impacted soil, sediment, groundwater and surface water at a remote Alaska site. Red Devil Mine is an abandoned mine in remote Alaska located 250 air miles and 1,500 marine/river barge miles from Anchorage, AK. The mine has impacted the soil, groundwater, and sediments at the site with a variety of contaminants including mercury and other metals and Petroleum Hydrocarbons. Weston under an exclusive contract with Marsh Creek LLC was hired by USACE to mitigate the impact to the environment from ongoing release of contaminants. Weston worked closely with USACE and Bureau of Land Management to design, approve, and implement field activities in accordance with Alaska Department of Environmental Conservation and CERCLA regulations to mitigate the impact from mine tailings. Work included clearing and grubbing an area along the creek under a Storm Water Pollution Prevention Plan, constructing a downstream sediment trap with a gabion basket weir to address contaminated sediments, excavating and stockpiling mine tailings at a location upstream of the sediment trap, constructing a gabion basket drop structure in the creek to transition the upper stream section to the lower stream section, and installing gabion baskets and mattresses along the entire length of the new alignment. Additional activities included decommissioning of groundwater monitoring wells and the excavation and on-site treatment of petroleum, lubricant, and oil-contaminated soil. Maintenance and monitoring were performed on Decision Units (DUs) containing 2,200 cubic yards (CY) of petroleum oil contaminated soil in the 2-acre soil land-spread area and one DU containing 22 CY of explosives-contaminated soil. Weston successfully realigned and stabilized the creek being impacted by mine tailings and mitigated downstream transport of contaminants.